Far-right parties are masquerading as champions for the majority of their nations’ citizens: the National Front now defends gay rights and social welfare, and denounces anti-Semitism, limning Islam as the real threat. At these times, it is worth revisiting our radical histories. Not only as a way of tracing left-wing traditions or reclaiming important chapters omitted from dominant narratives, but because history isn’t a series of failures. Our past is also full of victories, small and large, that can help shape the future – something Liam Byrne shows in his essay on Australia’s anti-conscription movement. It has been eighty years since the Battle of Cable Street, when 300,000 residents, communists and trade unionists barricaded London’s East End, refusing to let Oswald Mosley and his Blackshirts march the streets and intimidate local residents, a large number of whom were Jewish. Their chant: No pasarán! or, They shall not pass. Today, London’s East End is home to a large Muslim community, and the same kind of activists who helped fight back the fascists in 1936 and in the decades since. It is a history that should give us hope. 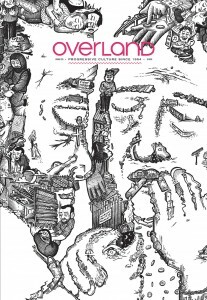 As well as essays on Trumpism, literary heroines swept up in radical movements and Australia’s working class today, this edition also contains haunting fiction by Tony Birch and Alex Philp, a seventeen-poet collaboration celebrating Gig Ryan’s birthday, and the winning entries of the second year of the Overland NUW Fair Australia Prize.